India has become first before many other countries to allow various indic languages to be used in URL, thus brekaing the language barrier on the internet. The other languages used in URLs till now are English (Roman), Russian (Crylic) and Arabic. 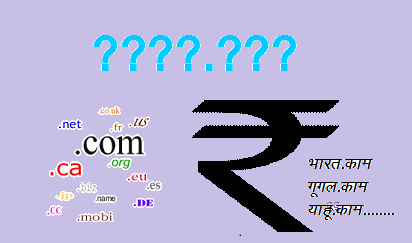 url stands for uniform resource locator i.e http://www.abc.com . India, a country where English is mostly used for internet and official purposes, use of indic languages on internet as content as well as in URL will promote the language within the country. Seven Indian languages of India from both from north and south India, notably Hindi, Punjabi, Gujarati, Bengali, Tamil, Telugu and Urdu, have cleared the process of being part of an entire web address written exclusively in them. Internet Corporation for Assigned Names and Numbers (ICANN), the organization which governs website addresses, has issued seven different domain names in each of these languages that can be used by the websites of using these regional languages. India’s growing IT power can now be seen as India has become the only country to have a eight domain extensions beside having .in. The interesting thing is India will be first country to have a domain extension for the Urdu language much before Pakistan whose official language is Urdu. Pakistan doesn’t look near to register a new domain extension. N Ravi Shankar, joint secretary at the Department of Information Technology, said the government had been trying to get the allotments for six months. ICANN rarely allots more than one domain extension to a country, Shankar said as quoted by DNA. India a country of more than 100 languages has 18 official languages which you can find on any Indian currency note. According to the government, people who speak or write in other languages shouldn’t feel sad as the government has has applied for similar allotments in other regional languages such as Malayalam, Marathi and Kannada, and the government is hopeful in getting those extensions as well in coming months. For non English friendly internet users, surfing the web has become even easier. Now users can type URL of any websitye in their own regional languag even if the actual domain is in English. The domain names can be registered from the National Internet Exchange of India, the agency which is already issuing domain that ends with .in. As usual these domains will also be alloted in first come first serve basis.